This is one of two casual holiday looks. 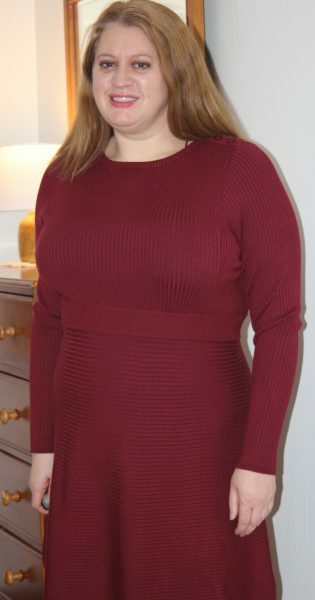 This burgundy sweater dress from Bravissimo would be great for someone who normally doesn’t wear dresses. It could be a dressier look with hose and heels or dressed down with tights and heels. The dress is form fitting past the hips and then flares out. I found this dress to be comfortable and flattering. The color is beautiful. I’ve never had a sweater dress from Bravissimo so I don’t know if this dress will stretch out. My knit cardigan from Bravissimo has not stretched out. Has anyone owned a sweater dress from Bravissimo? I absolutely LOVE Bravissimo and have to thank you for alerting us to ebay selling the overstock Pepperberry. I’ve gotten a few more things that way at much lower prices – so thanks for that. I do have a sweater dress from Bravissimo and love it. I’ve had it about 6 years now and it holds it shape beautifully. I don’t hang it in the closet, but fold it over the hanger bar so it won’t stretch out. don’t know if it would. And as much as it’s comfy and I love wearing it – I alway give it a chance to recover for a few days before wearing it again. Thanks for your blog. Totally wonderful and helpful. And this dress looks amazing on you! So great that you found Bravissimo deals on eBay!